Constrictive pericarditis is long-term (chronic) inflammation of the sac-like covering of the heart (the pericardium) with thickening and scarring. Abnormal fluid buildup in the covering of the heart. This may occur because of infection or as a complication of surgery. The condition may also develop without a clear cause. It is rare in children. 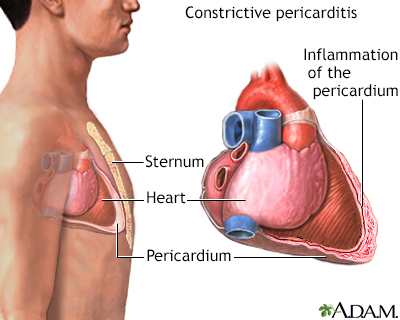 When you have constrictive pericarditis, the inflammation causes the covering of the heart to become thick and rigid. This makes it hard for the heart to stretch properly when it beats. As a result, the heart chambers don't fill up with enough blood. Blood backs up behind the heart, causing heart swelling and other symptoms of heart failure. Constrictive pericarditis is very hard to diagnose. Signs and symptoms are similar to other conditions such as restrictive cardiomyopathy and cardiac tamponade. Your health care provider will need to rule out these conditions when making a diagnosis. A physical exam may show that your neck veins stick out. This indicates increased pressure around the heart. When it happens due to constrictive pericarditis that is called Kussmaul's sign. The provider may note weak or distant heart sounds when listening to your chest with a stethoscope. A knocking sound may also be heard. The physical exam may also reveal liver swelling and fluid in the belly area. The goal of treatment is to improve heart function. The cause must be identified and treated. Depending on the source of the problem, treatment may include antibiotics, medicines for tuberculosis, or other treatments. Diuretics ("water pills") are often used in small doses to help the body remove excess fluid. Pain medicines may be needed for discomfort. Some people may need to cut down on their activity. A low-sodium diet may also be recommended. If other methods DO NOT control the problem, surgery called a pericardiectomy may be needed. This involves cutting or removing the scarring and part of the sac-like covering of the heart. Constrictive pericarditis may be life threatening if untreated. However, surgery to treat the condition has a high risk for complications. For this reason, it is most often done in people who have severe symptoms. Call your provider if you have symptoms of constrictive pericarditis. Constrictive pericarditis in some cases is not preventable. However, conditions that can lead to constrictive pericarditis should be properly treated. Jouriles NJ. 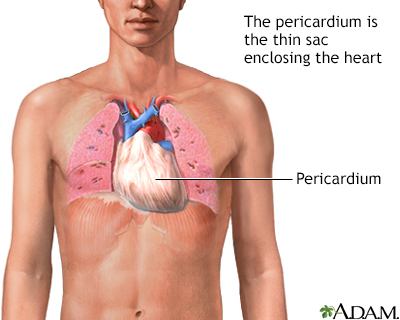 Pericardial and Myocardial Disease. In Walls RM, Hockberger RS, Gausche-Hill M, eds. Rosen's Emergency Medicine: Concepts and Clinical Practice. 9th ed. Philadelphia, PA: Elsevier Saunders; 2018:chap 72.